Any work we do with God as the focus is a work of God. However, not every work of God is in line with the will of God for our lives or for that particular moment. It is not just enough to busy yourself with everything that goes on in the church, sometimes you have to pause and ask God, what am I supposed to be doing now? Is God satisfied with the food I took now? Remember when you are in Christ it is no more about you but Him. So in Christ we don’t eat to satisfy our bellies but rather His. 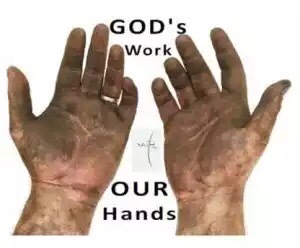 Meaning we do not work in the house of God just for working sake or just because we feel like it, for if we do, we might just miss necessary details. But we do so to accomplish the purpose He has for our lives that very moment. Sometimes we do things because others are doing them or because we desire them…even Jesus had to overlook His will so the will of the Father which is perfect to be fulfilled and by that decision you and I are alive today! Is it the will of God in that particular moment when the whole church is on their knees praying seriously, and you decide to go round taking a roll call on the members? Or the guitarist putting strings together whiles the keyboardist be hitting key notes? Have you ever wondered if that is what you are supposed to be doing at that particular moment? Sometimes we become too general that we miss some specific blessings in moments. At the end of it all, will you be able to say those three words as Jesus said,IT IS FINISHED, and be satisfied because you have accomplished the Fathers will and not yours? Jesus’ greatest satisfaction is found in you doing His will above everything else. Make His satisfaction your prime focus. Amen. Thanks for the motivation dear. may we prove what is that good and acceptable and perfect will of God.